To be considered a mineral it must have been formed by natural geologic processes. Laboratory created gems (synthetic diamonds, rubies, etc.) don’t count. By definition, minerals are solid within the normal temperature ranges of the earth’s surface. Generally, a mineral is a naturally occurring solid with a crystalline structure. Halite or table salt is a mineral. Sugar is a crystalline solid but comes from plants, sugar cane or sugar beets. This classifies it as an organic compound and so is not a mineral. Coal on the other hand also comes from plants (organic) and is generally considered a mineral. There are also marine animals that make their shells from calcite (calcium carbonate). Calcite is a mineral but since it is secreted by animals to form shells it is inorganic. Geologists generally consider this inorganic calcite a mineral. Each mineral has a particular chemical make up. 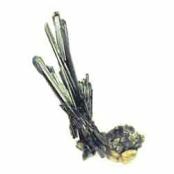 While most minerals are compounds of two or more elements, some minerals are made up of a single element. 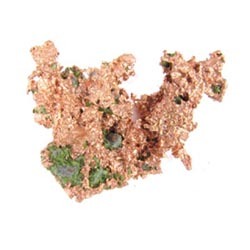 Gold, silver and copper are called native elements and occur in nature in relatively pure form. The vast majority of minerals are compounds or mixtures of elements. These mixtures are consistent. 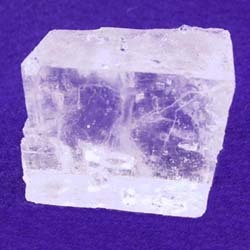 For halite, the chemical formula is NaCl or sodium chloride. Each sodium atom is combined with one chlorine atom. The formula for Quartz is SiO2, silicon oxide. For every atom of silicone, there are two atoms of oxygen. There are about 4000 known minerals on earth. Each one is a unique substance with its own chemical formula. Most of these are very rare. That narrows down the field quite a bit. Minerals have an orderly crystalline structure. This means that the atoms or ions that make up a mineral are arranged in an orderly and repetitive manner. What is a mineral? See examples here.